Tarte Amazonian Clay Smoothing Balm is a new foundation that makes an appearance is the Tarte Beauty in the Basics May QVC Today’s Special Value which debuts exclusively on QVC on May 11th. The new Tarte Amazonian Clay Smoothing Balm was inspired by Tarte’s Amazonian Clay Full Coverage Foundation. Balm is an accurate description of this product as it is in fact a balm and NOT a cream compact foundation product even though that’s exactly what it looks like. I typically dislike cream compact foundations as they feel a bit too heavy and greasy to me plus they all make me think of Benefit Some Kind of Gorgeous! I was relieved to see that Tarte’s new Amazonian Clay Smoothing Balm is in fact just that, a balm! This comes housed in a 0.31 oz compact with a generously sized mirror and when you purchase the Beauty in the Basics set you get in your choice of Fair, Light, Light/Medium, Medium, Tan, and Deep. The set is $47 so its almost like purchasing the foundation and brush and getting a bunch of other stuff free! Plus QVC now offers a new flat rate shipping on beauty of $30 so for $50 bucks you get a ton of delicious Tarte! This is a thinner balm with a very, very light creamy consistency. It’s not balmy nor is it greasy, shiny, or oily. I think automatically when you think of a balm you might think mega hydrating but this isn’t a balm texture in that sense! It actually applies like a powder and sets to a matte satiny finish that feels very much like a powder. Tarte gives you a very large Bamboo Smoothing Balm Brush to apply it which has massive bristles. It’s a good buffing brush but a LITTLE too large for my liking so I felt like I didn’t have a ton of control when applying the balm. For me, it applied best with my fingers as I could smooth and blend it out easily. Although I personally have drier skin I didn’t feel like this clung to my drier areas! It had a very smooth, soft appearance once blended out and provided sheer, natural coverage that evened out my skin tone and brightened up my complexion very nicely. Tarte says coverage is buildable but personally I get more of a my skin but better finish with this so it’ll likely even out your skin tone, brighten, and possibly hide minor redness or darkness but isn’t an ideal pick if you desire or need medium or heavier coverage. For me, cream compact foundations sound lovely in theory but they typically turn out to be very heavy and quite oily or greasy on my skin. They also feel very mask-like. I love the idea of them because I have drier skin but they end up not really working out for me. Tarte perfects the cream compact foundation formula with a super light formula that melds beautifully with skin and provides breathable, natural coverage. The wear time varies for me on this little guy. If I’m inside I do well at around five hours of wear but outside, on a warmer day, (I wore it yesterday during a rather nice warm, sunny day) and it seems to be a bit shorter at four hours before showing signs of wear. I like this formula a lot, was excited to try it out, and quite pleased at the outcome. If you’re looking lightweight, natural Summer coverage I’d suggest giving the Tarte Amazonian Clay Smoothing Balm a try! You can grab Tarte Amazonian Clay Smoothing Balm now on QVC.com in the new Tarte Beauty in the Basics May QVC Today’s Special Value or wait for the debut on May 11th to see it live on QVC! What shade did you swatch here? What shade is this? What undertone did it have? I was not impressed with the bomb not a good product for me because I need coverage. I thought I would love the brush but find the bristles a little hard/dense and way too big for this compact. 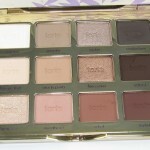 Did you try out the eyeshadow quad, I have been dying to see swatches & reviews (I have not used mine yet). I agree with the brush being a BIG disappointment. I found it VERY harsh to use on my skin, causing flaking and peeling. Unfortunately I got this set and brought on a trip with me so for the first week I had to use “as is”. Very disappointing. Now that I am home, I will try the balm with my Beauty Blender and see if I can get less painful and unsightly results. The eye shadows are not the same quality as the Tartelette Palette. Very little color payoff. 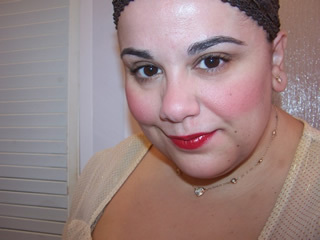 I like the Lights, Camera Flashes mascara and the LipSurgence Vintage lip color. Great bright coral for summer. I got the set already and wasn’t sure whether I would like this foundation because I actually really liked the liquid version they said it was based on but I love it! It’s lighter and doesn’t make my combo skin oily like I thought it would. I like a lighter coverage so this one really works for me. I have worn it every day since I got it! I think it’s my new favorite foundation! And the fair worked great for me! does the fair have a pink undertone? or is it more neutral? I think I would need fair but don’t want a pink undertone. already ordered (and auto-delivery!) soooooo excited to try this!!! Did it settle into pores at all? I wear the 12-hour Tarte Amazonian Clay foundation now and I really like the finish and color match to my skin, but if I don’t prime really well (powder done Goss style before foundation seems to give the best result), it settles into my pores and looks terrible. Ok, I may have to try this! I’m trying to find a good travel foundation and this looks like it might be it. As long as it isn’t greasy! nope, very soft, silky, feels like powder! No grease! Muse, did you notice the color being darker? 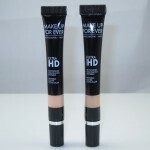 Some of the reviews say their normal foundation color in this brand was darker than they expected. I’ve not tried Tarte foundation at all so not sure which color to order. for Light it is indeed pretty dark Dee. Depending the range of Tarte foundations they either run too light or too dark in my experience. Apparently the balm might be running dark so you might want to go a shade down when selecting a color. crap. i got medium. buutttt…would work for summer skin! This compact really reminds me of the MAC Prep and Prime BB cream compact. I wonder how they compare. 🙂 Thanks for the review…I normally wear Light in all Tarte products! my pleasure! Hope you like Penny! Hi Susan I’m not really sure. I haven’t seen any of the other colors in person! I just have the light version but not sure how the others look so can’t really do a comparison between it and tarte having only tried one shade of the tarte balm. Just a question. Are Tarte products made in China? some are, some aren’t Bea. I saw this kit offered the other day but I missed it and I’m so excited to see it back today as TSV. But since I missed it I ended up ordering Tart’s 12 hour foundation as I needed something new for summer. I don’t really need another foundation, but do you think I could use this balm as a contour shade instead. This is a great price for the other products included so I definitely don’t want to miss out My skin is fair, what shade do you think would work best as a contour for me? I’m not really sure Samantha, I only have one shade and don’t know what the other shades look like so it is hard to recommend a shade having not seen it for myself! Sorry. haha 🙂 hope you like Liz! hope it worked for you Donna 🙂 aw thank you! Thank you for the review. I love most of the Tarte line and was wondering how this new balm would compare as a foundation. I have oily skin so I tend to stay away from liquid or creams but I think I will definitely try this set. How do you get to try new products before they are available to the public for purchase?